Patrick was born and raised in Argentina. Holder of both Argentinian and French passports, he volunteered with Land and Culture Organization after the 1988 Spitak Earthquake. Shortly after he moved to Armenia and worked on various projects, including working in Stepanakert for a year. Died in November 2002 of heart failure. He passed away in Armenia, his remains were buried in Buenos Aires. The HOKEHANKISD at the church was extremly sad and emotive. Hundreds of people were there to confirm the love and respect we all had for Patrick. “In a few days, a khatchkar will be set near Saghmosavank. It will say “in Patrick Tateossian´s memory, born in Buenos Aires, Argentina”. This stone cross will try to pay tribute to an Armenian young from Argentina, who worked for almost a decade in the Mother Land. But this stone won´t express the livings, the stories and emotions of Patrick´s dayly working. “Patrick arrived Armenia after the Independence, with not much knowledge about the country, virgin-minded of any ideological or political partisanship preconceptions from the previous period. This way, he could easily understand the Real Armenia, the country under his eyes, not the one imagined by books. “This kind of privileges are not available for anyone, and less people would make good use of it. Patrick was touched by destiny, and begun slowly, in different jobs, in differents tasks, to build a bridge that tried to make things easier between Hayastan’s armenians and abroad’s armenians, re-opening a jammed way, making it better, strengthening it. “Patrick achieved in a short time the recognition as “Without title Ambassador” of Argentina’s Armenian community in Yerevan. An honour that implied a charge that he accepted with his natural goodness: he was postman, chauffeur, counselor and translator, earning the best salary nobody does: people’s friendship. “Today es quite easy get in Armenia: just go through customs. The stamp in our passports are the proof. More difficult is to carry Armenia in our hearts, there isn’t material stamps for it. Patrick Tateossian belonged to this two categories: he obtained something that very few persons can achieve during their lives: that is to enter himself as well in people’s hearts. That stamp, that sign, will last as long as his friends’ lives and memories. 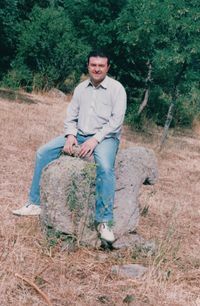 “There is a khatchkar at Sagmossavank, a stone cross. Is a bridge’s fundamental stone that link us to Armenia. Not to a government, not to an institution. That bridge links us to the people. That bridge is not built in months or years, that bridge never ends. Patrik Tateossian knew it. Let us be conscious fo the magnitude of this perennial task. I was fifteen years old when i saw him at the very first time. On that occasion, he gave us a conference about agriculture in armenia and the armenian lifestyle as well. We got astonished when the school director, Ms. Kristin Tahta introduced him as a young argentinean guy who started to live in The Republic of Armenia and to work for its progress. We were surprised about the idea of a professional argentinean of armenian origin returning to Armenia and not to other country. We saw the first example of repatriation in Argentina. Hundreds of stupid-minded-pseudo-charlatan heros filled their mouths with promises of freedom, songs about how to reconquer armenia and burn istambul and such things for many decades. But when the freedom came, no one came back to Armenia. A humble guy did it. That conference where i knew him was in 1995. In those times i use to avoid all about Armenia and armenians. Some years later, some things changed a lot...In 1998 i traveled to Armenia. I couloured my head with pink and i took my guitar there to Yerevan. I was having the old nescafeian breakfast of the Hotel Armenia when i felt an index finger knocking on my arm. I heard a friendly voice "Ustedes son Argentinos?" (Are you Argentinean?) And there he was again. Both we got surprised. My brain was saying "This ArG-Menian is still living in Yerevan, the man of the conference!!!". And he got surprised too when i told him i recognized him from that talk he gave us. After that trip to armenia and those coincidences i got Armeniantitis as a fever. I was sure i was going to see him soon. Years later in Buenos Aires when we got suddenly both of us walking on the armenian street he used to say as a joke. "You are not the same guy i met in Yerevan. The one i met there had a pinkish coloured hair!!!" Then we started to keep a fluent touch by e-mail periodically. Last year he brought me some CD´s i ordered him from Paris, The Kotchnak Ensemble, who´s leader Aram Kerovpian was a very close friend of him. He was that kind of person that could not deny any favour. Step by step we discovered that we had lots of relatives, friends and points of view in common. The big armenian net was unifying us and promising some co-working activities for the future. This current year we sent books to each other. We were getting to a closer friendship. Such as i use to call him Ice-cream man (Heladero) because of a freezer brand name that was exactly the same as his name. He made Armenia to progress and Armenia gave him some progress, too. He was moving up to a big russian style house when this happened. He was one of the main bridges to unite Armenia with Argentina. Now he is a bridge to heaven. Every time i´ll listen to Kotchak i will remember him, every time i´ll read the book about armenian medieval architecture he sent me i will remember him and every time that i know a new spiurkahay that returns to its country I WILL REMEMBER HIM. Badrig Jan, We will remember you. To The Eternal Argentinean Ambassador for the Armenian Republic. This page was last edited on 19 April 2019, at 16:40.